Blend cookie mix, butter and water; reserve 1/2 cup dough. Press remaining dough into greased and floured 9-inch pie plate. Bake at 350°F for 14 to 16 minutes or until golden brown on edge. Cool on cooling rack 10 minutes. Roll reserved dough into 16-1/2-inch balls and place on ungreased cookie sheet; press slightly to flatten. Bake at 350°F 6 to 8 minutes or until set. Spoon about 1/4 cup fudge topping onto bottom crust. Spoon ice cream into crust. Freeze at least 2 hours. 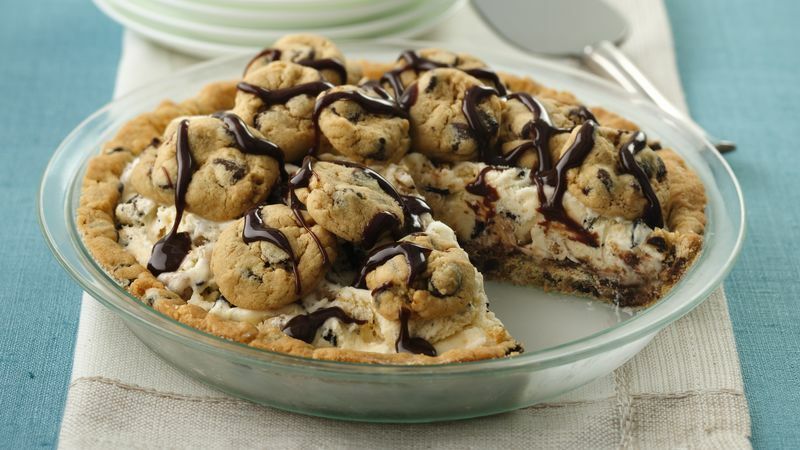 Place cookies on pie by pressing them in at an angle. Microwave remaining 1/4 cup fudge topping uncovered 30 seconds on High; drizzle over pie. Make it your way. Use your favorite ice cream and ice cream topping.